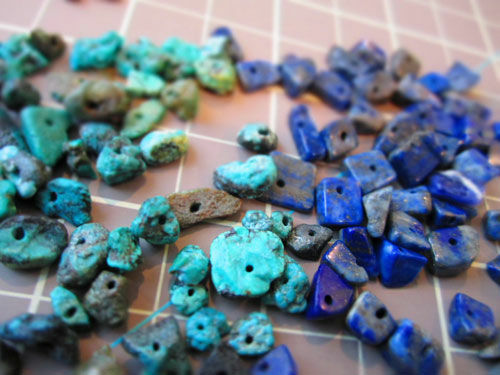 On a trip out to Arizona, my mom bought a few rock bracelets that contains small colorful stones. 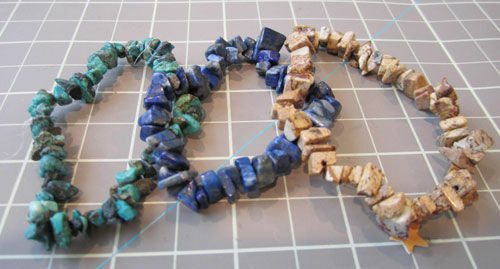 They were strung on really cheap elastic, I think, which were more about making the sale of the rocks to be used in another capacity than to actually wear them as bracelets as is. Well they started to fall apart so she came to me for a solution. BEFORE: Here are three of the "bracelets" she brought to me "do something" to make them wearable. 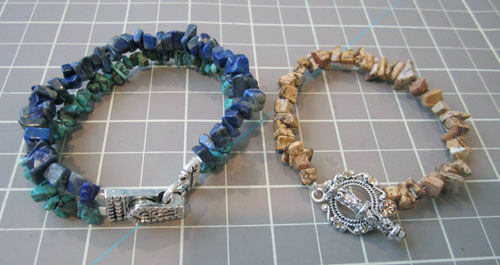 I snipped the elastic, took the stones and restrung them onto two different bracelets with better closures. AFTER: The bracelet on the left is a double strand, as my mom wears alot of blue and green together, with a magnetic closure. The second is a single strand that uses a toggle closure. Nothing too crazy or different than what she had except they have a nicer user friendly closure and use a tougher stringing wire so they don't snap.